Never. We never had these until about 10 years ago when they showed up in shops, flower shops in December. We call them “Christmas flower” but don’t know the real name. We saw such flowers in english/american movies. I once both this for my mom… but somehow don’t like it. Your mom didn’t like it??? Actually we both didn’t like it… it feels like it’s so “far away” from our Christmas feeling. 🙂 I now it’s hard to understand but it’s something like Halloween. It’s here only for ten years (maybe) and none (except kids) like it… It’s just not our stuff… Like we have “puzurs” have you ever seen something like that !? Love this painting and love the story!! Your poinsettia is gorgeous. I I wasn’t aware the little story behind the Poinsettia being the Christmas flower. Our shops get full of poinsettia flowers and plants from now till Christmas, now I will look at the poinsettia in a new light. Interesting post, & striking watercolour! One has to love that sweet legend and your beautiful painting too! I will share a little history that you may already know. Joel Poinsett brought the first plant here from Mexico in the 1800’s and after growing them, sent them to friends and botanical gardens. 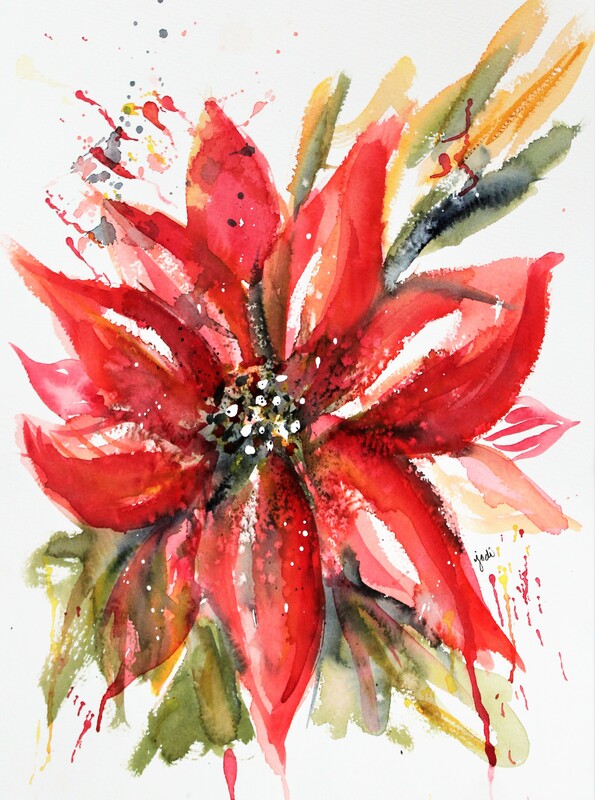 One came to a Philadelphia nurseryman from a friend and later became known as the poinsettia. This is a much abbreviated history that my Gram used to tell us when we were little. She is the only person I ever knew that successfully had poinsettias bloom more than once. Gram was the human encyclopedia of flower facts! Beautiful, Jodi! I enjoyed hearing the story of the poinsettias. Just to let you know that they are poisonous to dogs (what I have heard). Yes – I’ve heard that too – but upon further investigation find it is a bit over exaggerated. Oh! That’s good to know! Good morning Jodi, Poinsettia is one of my favorite flowers. Your art is magnificent, it burst off the page. I did not know that story! The only time we have a poinsetta in the house is when somebody happens to gift one to us during the holidays, lol! I’ve never been able to keep them alive, either. Lovely my dear… yet again!! Beautiful! And such brilliant color, love it! A beautiful vibrant watercolour Jodi…. I so enjoyed your story about the Poinsettia flower. You do a magnificent job with your painting! I’ve never heard that story! I like poinsettias enough. I don’t think I’ve ever had one in my home but I like looking at them in the stores. Your painting is absolutely lovely. Well done!! ohhh, Pepita!! how cute! and flowers of the holy night…. love how that sounds. Great little story Jodi for us at just the right time too 🙂 gorgeous scarlet reds in your flower, with nice drips and vibrancy – a color full flower of the holy night ! my pleasure, … I do like that name, Pepita… makes me Smile! Beautiful Jodi! Sweet story, I’ve never heard that! Oh, Jodi!! So LOVE love your Poinsettia !! ❤️❤️❤️ And I enjoyed your story about how the flower. 🌟 I have a funny story about Poinsettias… When I was in college, a friend and I had a job one year during the holidays to water all the Poinsettias at Nordstroms. At the time, they used to decorate their stores with LOTS of this flower. By the end of this job, I was so sick of Poinsettias!! LOL! 😝 It took me several years before I would buy one! lol – I’m sure! I’ll be there were hundreds! I never heard the story before. It brings new meaning to the flower. Your painting is beautiful! LOL – Seems they live forever. I have to admit I’m totally over them after the new year…..
Me, too! But they just keep hanging in there…. I needed to go back so far to catch up, my dear Jodi! So sorry, last few weeks before my vacation were full of work and not much visiting blogs. Thank you, dear Jodi! I will post about a rather scary Thanksgiving tomorrow. Not to worry anyone over this loving and special weekend. . .